We offer wide range of Ultrasonic Cleaners For Pharmaceuticals. 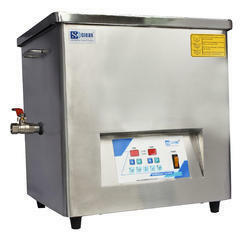 These pharmaceutical ultrasonic cleaners are very efficient in their operation. These machines are available at industry leading prices. Ultrasonic Cleaners for Pharmaceuticals has been specifically designed for pharmacy industry. The use of water based neutral cleaning media ensures the cost-effectiveness of this system. All chamber are provided with effective overflow arrangement. It also has an in-built drying system along with filtration and recirculation system for continues filtration & recirculation of liquid. Looking for Ultrasonic Cleaners For Pharmaceuticals ?